David Llorente, CEO, Narrativa, at Flat6Labs Demo Day. At first glance, the above looks like a snippet from a typical post-match report, put together by a sports journalist who covered the game, answering the significant what, who, where, and when questions that govern such pieces. So what makes this write-up special? Well, this particular report was not written by a human being- it was put together by an artificial intelligence (AI) system, and generated using rows of numerical data in just a few seconds. The AI system that wrote it is a product of Narrativa, a natural language-generation startup based right here in Abu Dhabi. Launched in the summer of 2015 by David Llorente (CEO), Eugenio Fernandez (Chief Scientist), and Antonio Moratilla (CTO) -research colleagues from university days- Narrativa’s technology takes complex data sets and transforms them into human narratives. “Across different industries, we identified a common problem,” says Llorente. “There is a need to create content at scale, and at a very low cost, [but] at the same time, we discovered that there is very low levels of monetization of the data that companies produce.” Hence, with a strategy to “disrupt the digital content industry,” Narrativa and its AI product GabrieleAI help companies generate “millions of narratives per day” with a marginal cost of “less than five cents per narrative.” To understand the “disruptive” potential of this claim, consider this claim against what Llorente calls a normal scenario, where one human can effectively generate only up to four narratives a day, and the “hundreds of dollars” involved in such human-generated content. Involved primarily in delivering news reports, earnings reports, product descriptions, etc. 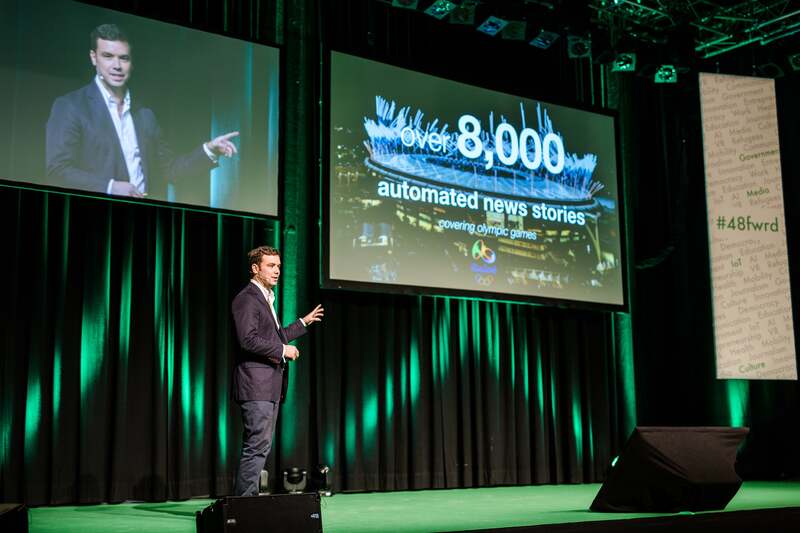 for its customer groups including news organizations, content companies, and e-commerce firms, Narrativa is keen to sign up other industry adopters too. According to Llorente, GabrieleAI’s ability to generate content at scale can be of huge benefits to growing ecommerce companies. “One of our e-commerce customers has more than 200 people generating product descriptions for their products, and now using Narrativa they are able to reduce this number drastically, and generate much more product descriptions than before,” he notes. He adds that customers are taken aback at the “quality of narratives” the technology produces, and that it’s almost impossible for anyone to guess that it was produced by a computer, and not a human. As of now, Narrativa serves three customers, though it says it has more than 11 customers in the pipeline. David Llorente, CEO, Narrativa at 48 Forward event.Image source: Narrativa. As a skeptical (and maybe a bit smug) journalist, I quiz Llorente about how GabrieleAI can go beyond being a solution delivering volume and speed to answer the critical “why” needed in news reports. Llorente is quick to clarify that while Narrativa’s tool is no match to the sophistication and analysis that a journalist brings to a story, the startup is currently working “with contextual data” to enrich narratives. “Narrativa is not trying to take out the job of journalists,” he says. “Instead, Narrativa is helping journalists to focus [on] the real stories, and leave the repetitive data-driven stories to us.” It’s quite evident that currently, the startup’s USP is the quantity of content that they can create for companies- that said, Llorente admits that the tool’s limitation only comes from the data itself, i.e. the problem of not having sufficient data. With large mainstream news organizations such as the Associated Press, The Washington Post, and many others already using software to churn out standard news reports, financial alerts, sports reports etc., Narrativa is pitted against growing competition in the field globally, but that doesn’t seem to worry Llorente. “Very few companies are using AI, and they use a rule-based approach instead.” He adds that compared to systems using rule-based methodologies, those building natural language-generation AI (like Narrativa) “have the advantage of being learning systems.” This “learning” feature is perhaps why Narrativa also allows customers to customize the technology using a platform they have developed. “Customers can train the technology by adding new example narratives, so the technology learns the writing style of the customer,” says Llorente. In this way, the system enables users to define the structure of the narratives. To help them edge closer to these milestones, Narrativa has already raised over US$250,000 in investment from investors, including Next Media Accelerator from Germany and Flat6Labs from the UAE, with Llorente also pooling in his own money for his enterprise. The startup is also looking to raise $500,000 currently. “We are looking for a decisive and savvy investor who shares our vision and who is willing to, together, disrupt the digital content industry,” says Llorente. And how has the hunt been so far? Llorente says that as technology gets “more complicated,” the process also becomes harder. Investors insist on validating the business by running pilots, which, inevitably, gets costly and slows things down. However, that has not deterred the team, which has been running pilot projects and demonstrating the capabilities of their products to MENA’s investors. 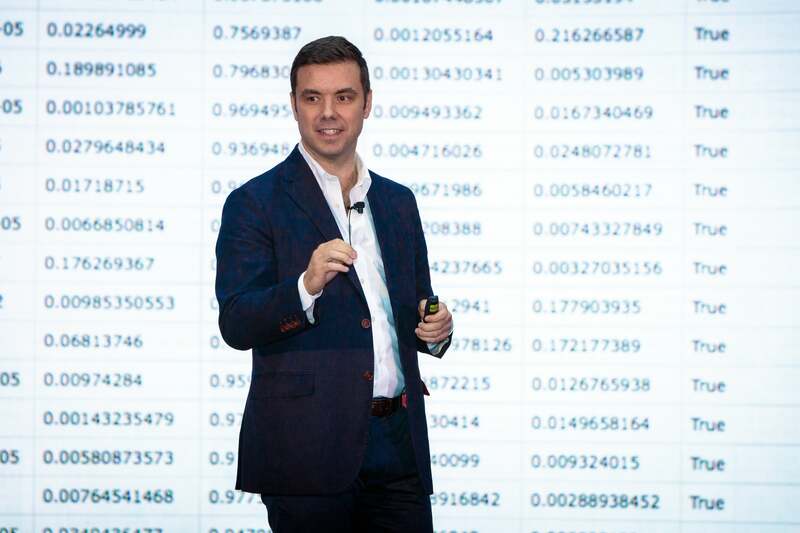 As for the emergence and growth of businesses based on AI and associated technologies, Llorente feels that time is ripe for such startups to take a shot at venture capital and institutional money, and grow across sectors. “AI and machine learning have not really changed much in the last 40 years; what has significantly changed is the amount of data available to train the systems and an incredible computing capacity that allow us to speed up the training of AI,” he explains. The entrepreneur also believes that AI, along with big data and the internet of things, is helping solve problems that were “previously irresolvable” and hence is impacting status quo across sectors. One thing, however, appears to be a recurring theme in any AI business- job roles being done away by rise of automation. Though unnerving, it is a result of the complex times we live in, a phase that the World Economic Forum calls the “The Fourth Industrial Revolution,” which looks like it’s here to stay, and Narrativa wants to make sure that it is well poised to be a leading company in such a world. David Llorente, CEO, Narrativa at Flat6Labs demo day.Image source: Narrativa. Why did you decide to start up in the UAE, and why did you align with Flat6Labs? What tips would you offer for entrepreneurs to start a business in the MENA region?